This is both the carpet & dirt version in 1 kit. 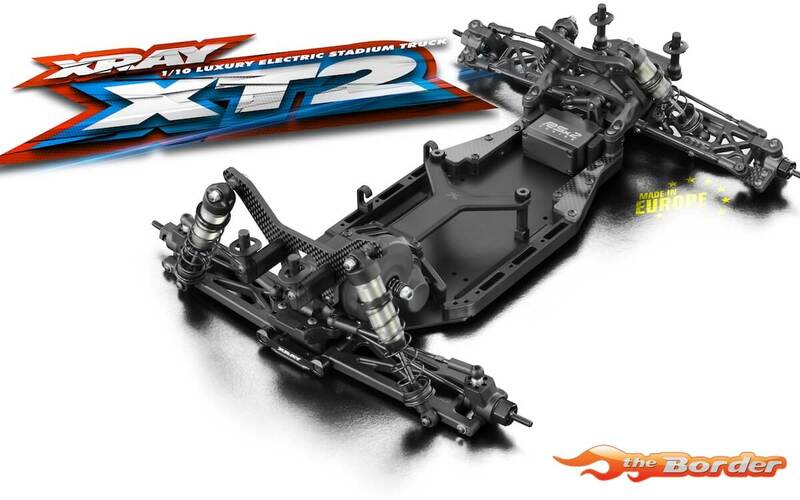 With the Uni-Platform™ concept both Carpet and Dirt gear boxes are included in the kit to tailor your XT2 to particular track conditions. For the Carpet Edition, the gear box with front motor position is used; for the Dirt Edition, the gear box with mid motor position is used. 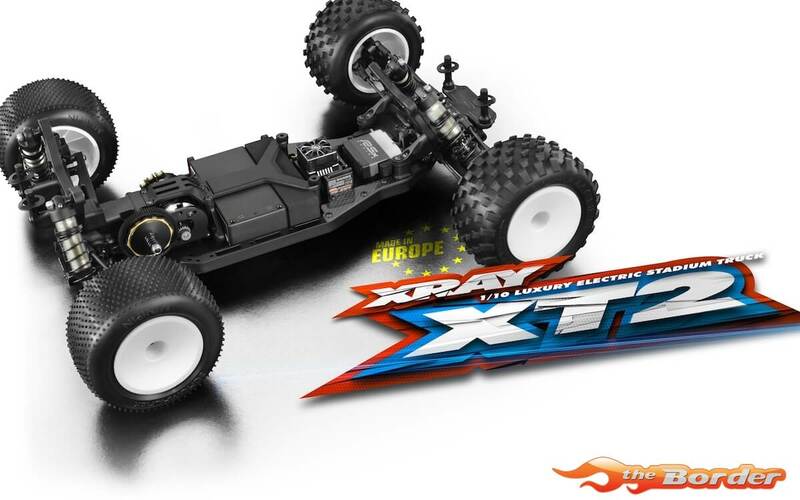 Carpet gear box – lowers the top shaft and moves the motor further forward in the chassis to improve steering and handling on higher-traction surfaces. 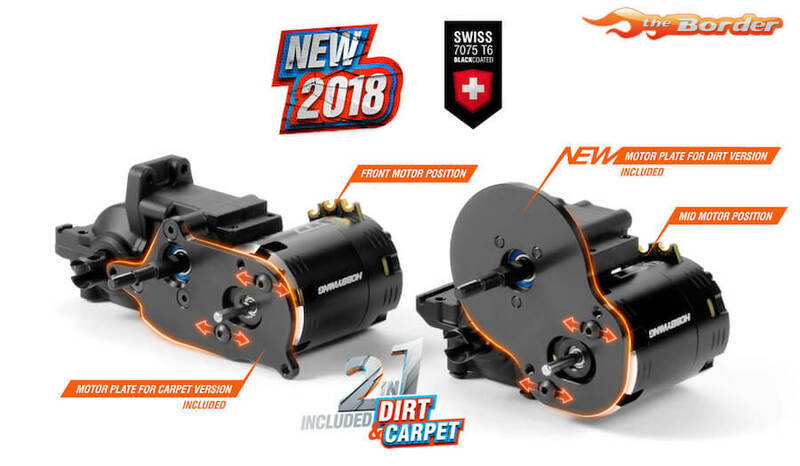 Dirt gear box – raises the top shaft and moves the motor closer to the differential, improving rear grip in lower-traction conditions. 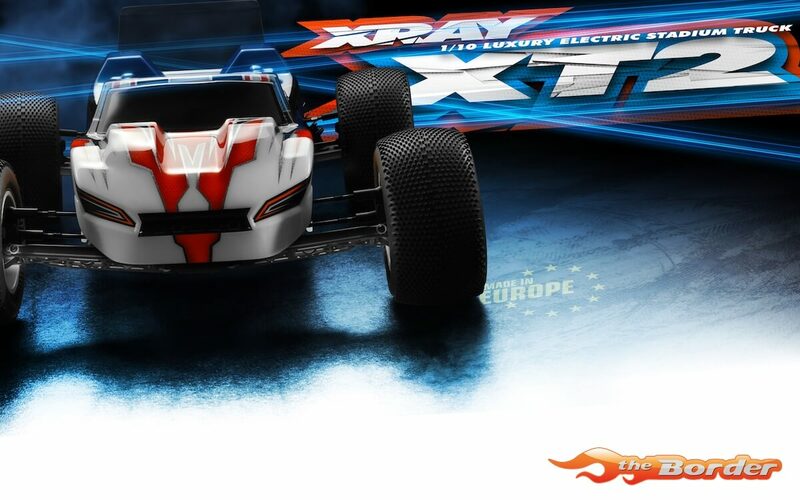 With the Uni-Platform™ concept, both ball differential and gear differential may be used to tailor the XT2 to particular track conditions. 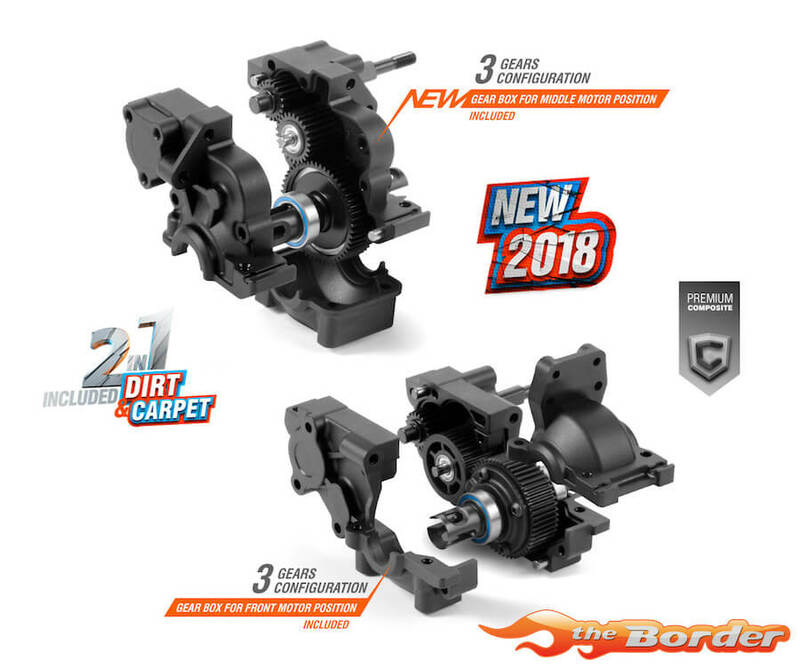 Gear Differential – Offers increased on-power steering that is beneficial on nearly all types of tracks, but is especially great on carpet and astro turf. Ball Differential – Recommended for very-low to medium-traction dirt and clay surfaces. 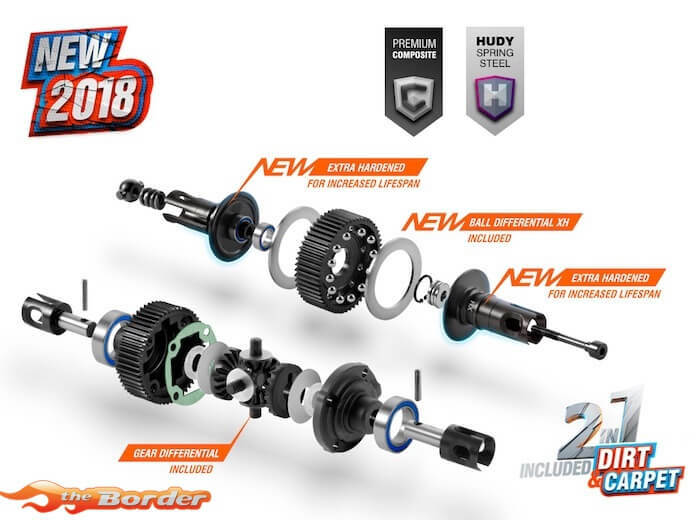 The externally-adjustable ball differential is machined from HUDY Spring Steel™ and is additionally hardened for extra durability and long lifespan. A high-quality carbide thrustbearing and carbide balls are included for ultra-smooth operation. The ball differential comes factory pre-assembled. To accommodate either the Carpet or Dirt gear box, two different motor plates are included to fit each particular gear box. 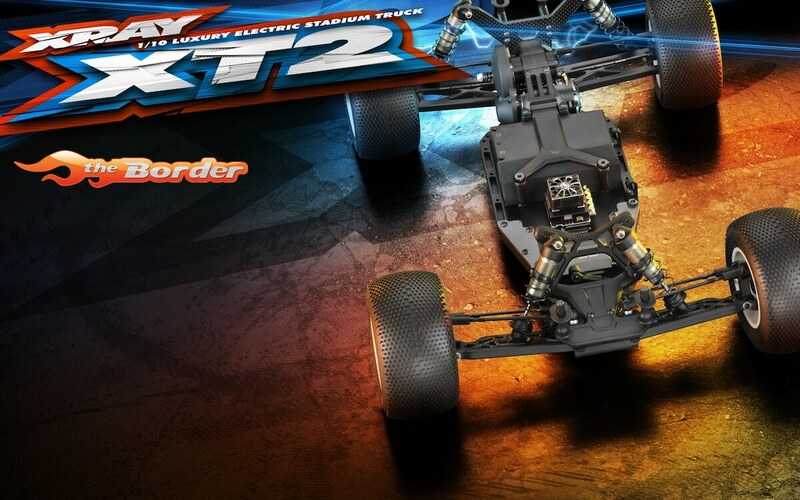 With the Uni-Platform™ concept, the XT2 includes two different rear shock towers. Composite Front shock tower include multiple shock positions. The upper brace is also part of the Multi-Flex™ system which allows flex adjustment of the front of the car for particular track conditions. 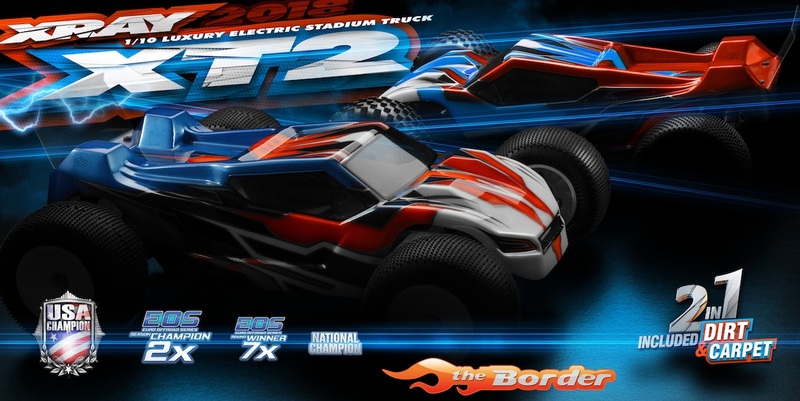 With the 2-in-1 Suspension Concept, the XT2 includes two different suspension arms suitable for particular track conditions. 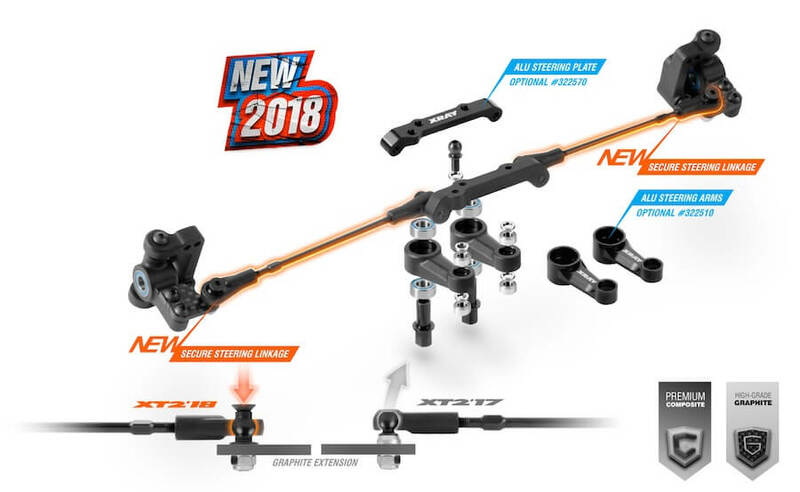 To increase the reliability of the steering system the universal ball features a backstop that ensures that the linkages will not disconnect in a crash. 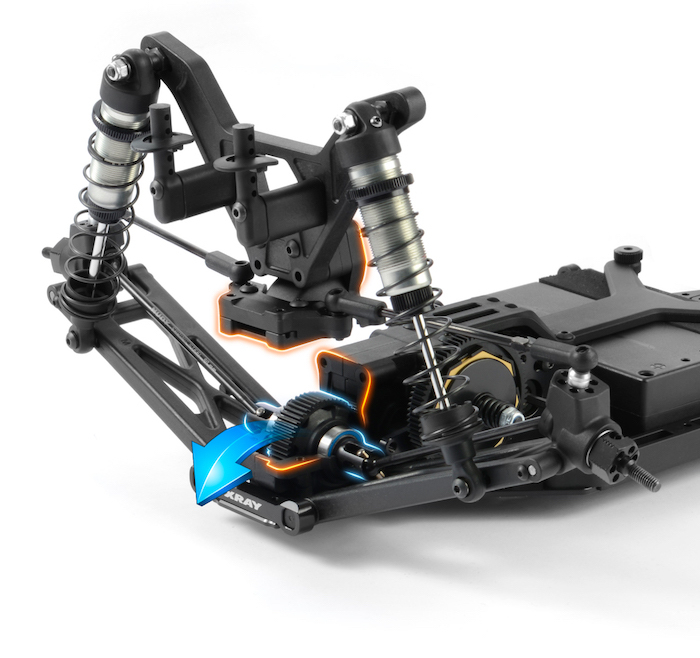 The dual-arm steering system is very simple yet effective. The steering system is fully bearing-equipped with 8 high-speed ball-bearings for very precise steering. Ackermann is easily adjusted by quickly & easily changing the steering link mounting positions on the steering plate. Further Ackermann adjustments may be made by inserting shims on the steering plate, and changing various graphite extension plates on the steering blocks. To improve the precision of the shock shaft movement, the lower composite shim was redesigned and updated with a more accurate and precise mould design. 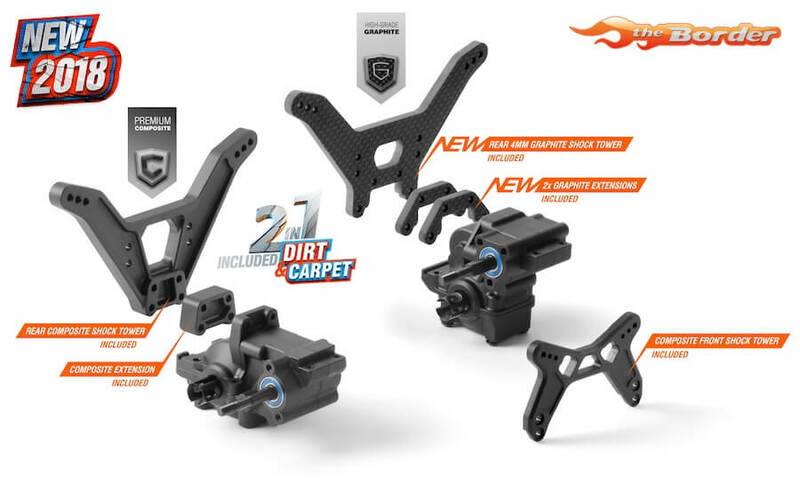 The included gear cover is used on the XT2 Dirt Edition to protect the gear box and gear from dirt.